But because it is not so easy for the Greek people to forget about Greece’s sovereign rights on the Aegean Sea, about Imia betrayal and the Greek marines who died in the name of the Simitis’ “thank you to the U.S. government”, the “grey zones” etc. there had to be found another way to make up a story for the Greek People. That story was the EEZ. We were of those who had been insisting from the very beginning that an EEZ declaration under the current circumstances of occupation and submission would simply mean a crime against the Greek people. “France, with its moves in Mali, has already made clear the opportunities for greater stability in the (Mediterranean basin) region, and for the peaceful resolution, wherever possible, of regional crises, such as the one in Syria and the Cyprus problem; and of course, as I said before, to deal with the huge waves of immigration that threaten all of Europe, which I might add, burden countries like Greece disproportionately. It is this reasoning with which we back France’s policy in Mali, a policy that shows decisiveness and responsibility on its part and for all of Europe,” Samaras said. “We have signed, as you know, the International Law of the Sea (UNCLOS), as have most countries in the world… Greece’s energy deposits are found in Greece’s maritime region; they are the mineral wealth for all of Europe, in general. 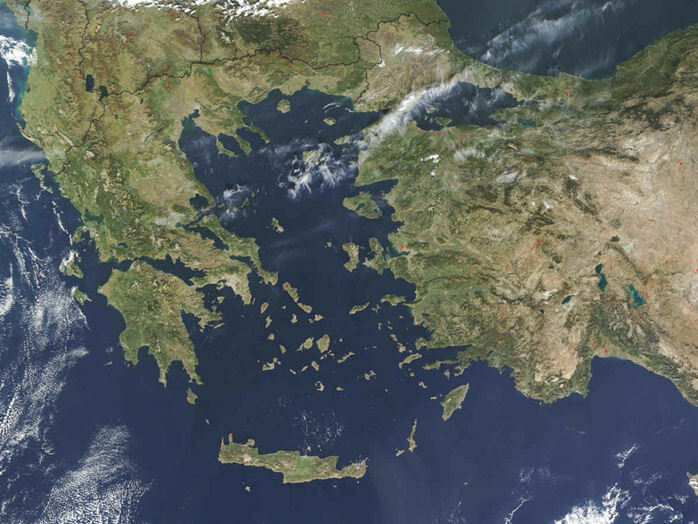 Greece has the right to delimitate its EEZ, as it emanates from UNCLOS, whenever it wants to. We will proceed with the correct moves that are necessary.’’ Samaras added. This is an outraging statement. Mr.Samaras, as a typical spokesperson of a gang cannot but praise France for taking action in Mali, regardless the fact that even inside France this policy has been condemned as neo-colonial. France’s excuse may be the Islamic threaten, but the main goal is the seizing of the mineral wealth of one of the richest countries in minerals in sub Saharan Africa. He doesn’t mind France intervening by invitation of the military junta that rules the country for many years supported by the French, nor this military action costing an incredibly large number of victims among the civilians. “We want to solve the problem in a friendly and peaceful manner because this is also in the interests of Europe. Together with Cyprus, we can play an even bigger role in the production of hydrocarbons to supply Europe from European sources” said Samaras. “… I believe that International Law and the Law of the Sea will prevail. If France can, of course, jointly exploit those deposits with Greece, it will do so’’. So, if anything is ever found in the Aegean Sea, it will have already been baptized ‘European’ and will have been delivered to the Europeans. The other day (07/03) Mr. Samaras made it even clearer at European People’s Party convention , when he said he wanted to give a “European dimension” to the national issues, such as defining the EEZ boundaries and stressed the need for a common foreign policy in Europe. Do you know what this means? Oh, nothing to worry about; just the official abolition of Greece’s sovereign rights. To mark EEZ boundaries you need to have first of all a sovereign state with sovereign rights over air, sea and ground. A European EEZ in the Aegean would mean that Greece resigns from its sovereign rights, which Greece hands them over to the European Union. Is this irrelevant with the fact the EU is heading very rapidly towards a European Federation? Of course not. European Federation is a new morpheme which will integrate the sovereign rights and the national sovereignty of its member-states starting by Greece. Only a few understood what Samaras was up to with regards to the EEZ but as soon as Tsipras’ officials (=the head of Greece’s opposition’s party) urged to applaud. George Stathakis ( SYRIZA deputy) said during an interview at the radio station Real (08/03) “Mr. Samaras’ move could prove brilliant” . was that he and the likes of him support any idea that leads to the dissolution of that miserable country called Greece and its absorption by the European colonialists. We don’t expect, of course, by Mr. Stathakis to know much about geopolitics, to even know that geopolitics is not a science but a reactionist theory which was reached its apogee during the Nazis. We shall only the ask the following question: can he name an example of a country that turned the use of its wealth resources from a crucial issue of internal politics into a problem of international geopolitics and wasn’t left into shambles by the big powers? He will not find a single one on a world scale. Just like Samaras, Tsipras with advisors like Stathakis, do not make policy for the sake this country and its people but for the sake of ‘Europe’, namely for Hollande, Merkel and others. This is why they all have sold off Greece and are trying to convince the Greek people that they have to learn to live like a slave within the frames of the European Federation without anything belonging to them. This is exactly what happens in the ‘Third Word’ countries. Any country that doesn’t know how to protect its sovereign rights and doesn’t nationalize its wealth resources, cannot declare an EEZ. On the contrary, it is turned into a colony, so that the powerful with their military or economic means can lute its resources. Is this the Greece we want? If yes, let’s then give everything away to the ‘Europeans’, let’s vote for Tsipras with the hope of a bit of dry bread and with the conscience of a beggar.